Grassy hills, concrete battlements and gun emplacements in Brisbane, Townsville and Thursday Island evoke the British imperial presence of the late nineteenth century. 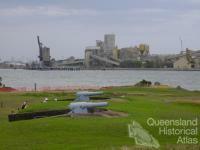 They are a reminder of a time when Queensland was a willing pawn in the strategic games of empire. Queen Victoria and her ministers ruled an Empire on which the sun literally never set. The oceans were its highways, essential to commerce and communications, emigration and the deployment of military power. 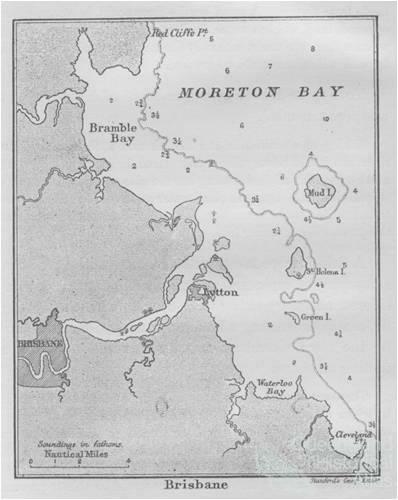 ‘It is as though the sea had been saturated with British influence’, wrote the imperialist Sir Charles Dilke in 1892, ‘and had deposited it along all the unprotected portion if its margin.’ Queensland’s long and underpopulated coastline, by contrast, seemed vulnerable in this era of international rivalry. Following the withdrawal of British military support for the Australian colonies in 1870, and amid international tensions, a military commission was appointed to advise the Australian colonies on schemes of defence. Colonel Sir William Drummond Jervois and Lt-Colonel Peter Scratchley commenced their work in Sydney in May 1877. Both were military engineers, firm adherents to the principles of coastal forts, who had earlier advised on the defence of Great Britain, Canada, India and South Australia. They travelled from colony to colony, steaming their way up and down the coast, pondering the difficulties of colonial defence. Their time in Queensland in August 1877 excited considerable interest and discussion on military matters, and generated the first blueprint for the colony’s defence. Existing defence units were meagre, and fortifications non-existent. The Commissioners found an amateur local volunteer force of nearly 1200 – 541 in Brisbane, 167 in Ipswich, and a total of 486 at Warwick, Toowoomba, Bundaberg and Rockhampton. In total they were commanded by a general staff of seven commissioned and non-commissioned officers. There were no cavalry or permanent artillery forces. Although Queensland did not present ‘so tempting an object of attack’ as either New South Wales or Victoria, as Jervois’ preliminary report of later that month stated, the real possibility of a naval assault on Brisbane or ‘desultory attacks on other places’ required some defensive preparations. Given British naval superiority, it was likely enemy attacks on the Queensland coast would be small-scale rather than a major invasion. Ironclad cruisers, operating alone or in a squadron of three or four vessels, might attack shipping, blockade coastal ports, bombard townships and cities and perhaps land an attacking force. A combination of military and naval defences was urged to resist such threats. 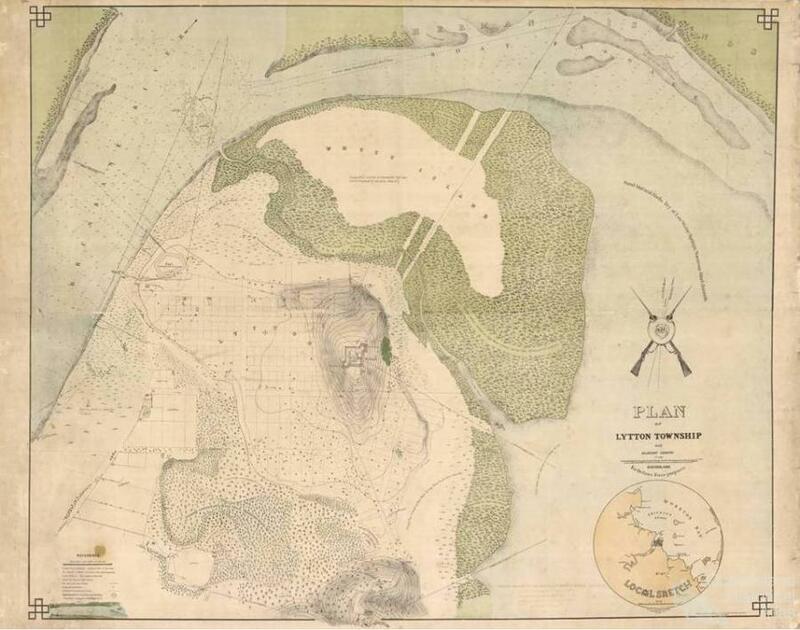 It was impossible to defend every harbour and township on the coastline, and only the settlements of Brisbane, Rockhampton and Maryborough were considered sufficiently large and important to be fortified directly. If an enemy attack came, the rest would have to rely on mobile naval vessels. To oppose a landing, I recommend, firstly, that a gun vessel of light draught should be provided ... to dash in amongst an enemy’s boats whilst in the shallow water between the anchorage and the shore, to which the enemy’s ships could not obtain access. Taking up a position in the boat channel at the mouth of the river, she would be very favourably placed for acting either to the north or the south, and for directing her fire also against the enemy’s ships, if desired. 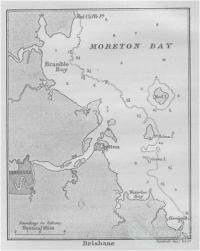 Given that enemy forces could land elsewhere on Moreton Bay, a field force of field artillery, engineers and infantry would also be required ‘to co-operate with the floating defence in preventing a landing, or in opposing an advance on the town if an enemy succeeded in obtaining a footing on shore.’ Smaller versions of the Brisbane plan were submitted for Rockhampton and Maryborough – torpedo defences of floating mines strung across the shipping channels, with artillery batteries nearby supported by mobile field forces. 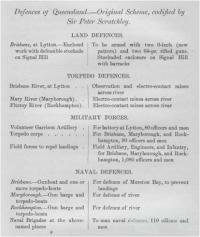 To effect this plan, a Naval Brigade and Torpedo Corps would need to be raised, a Garrison Artillery battery established for the Lytton defences, and a better-organised Field Force for operational deployments. The Commissioners did not favour cavalry, as mounted soldiers could be recruited from the police force in an emergency. It was also necessary to improve the telegraphic network along the coast, and purchase at least one armoured gun-boat, ‘a good, swift vessel which would be able to afford protection to places on the coast generally, and within the reef, against privateers or gunboats’, reported Jervois. 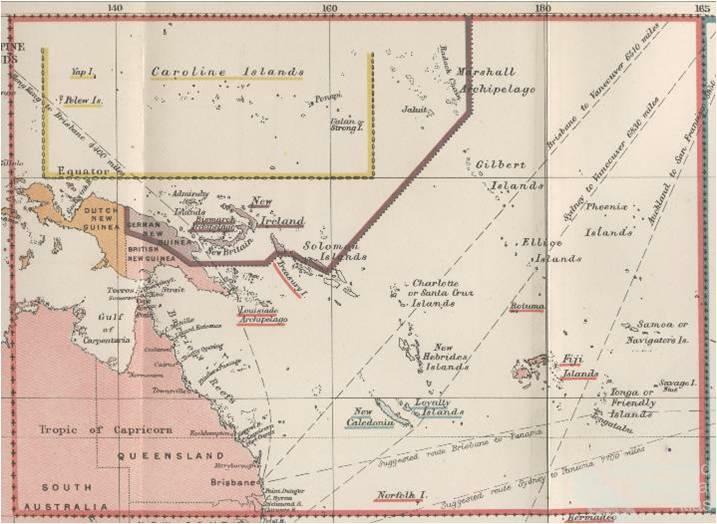 Although subject to local scepticism and the inevitable cost-cutting, in time these plans were largely adopted as the blueprint for Queensland’s colonial defence. 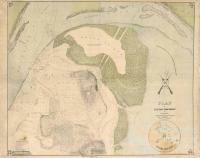 The result was a scheme of fortified coastal batteries and submarine mines, supported by land based forces. 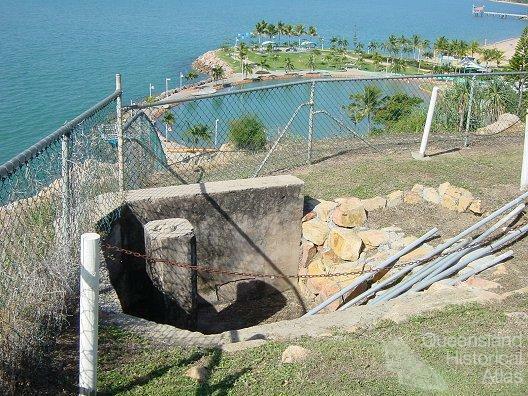 Coastal forts had been built by the mid-1890s at Lytton, Kissing Point near Townsville, and Green Hill on Thursday Island. At Lytton the defences also included submarine mines that could be submerged in the river. A small permanent battery of artillery for the forts and engineers to work the submarine mines was established. The permanent force also provided a cadre of experienced instructors who trained the part-time militia and volunteer forces, artillery batteries, infantry companies and mounted infantry companies, that were established in more than 40 towns across the colony. A small Marine Defence Force also took shape, consisting of the two gunboats Gayunduh and Paluma, the torpedo boat Mosquito, and supplemented by Naval Brigade companies at various ports. 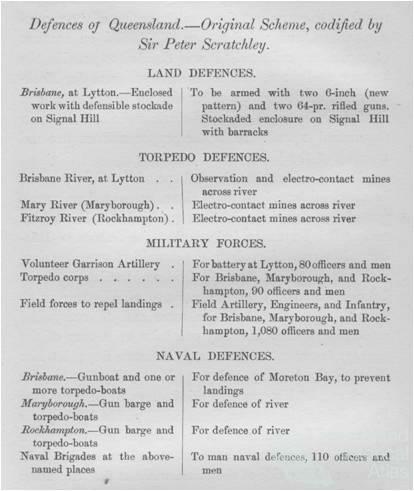 In giving shape to many vague presuppositions and assumptions, Jervois and Scratchley’s reports directed Australian preparations for coastal defence for the remainder of the nineteenth century, with the British Colonial Defence Committee tweaking the details as circumstances required. Combination for mutual defence was one of the cornerstones of Federation. When the Australian colonies came together to build Green Hill Fort on Thursday Island in keeping with the Defence Commissioners’ scheme, it was an unprecedented collaboration that foreshadowed the movement to a Commonwealth. All three fortresses were built in landscapes that commanded a view and enabled concealment and service of armaments through connected underground passages. Fort Lytton in Brisbane was built on grassy embankments between 1879-81 with two guns to provide covering fire over the Brisbane River, and a moat for protection. 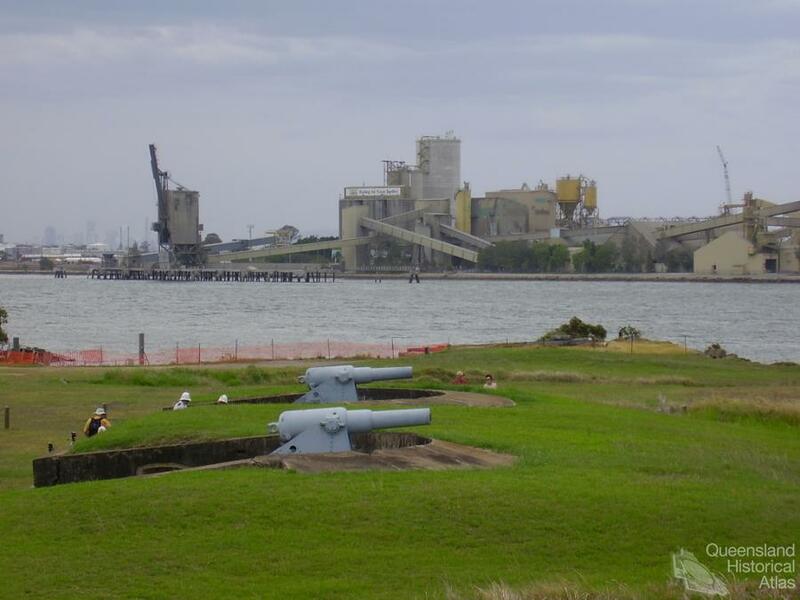 It is now part of the Fort Lytton National Park and a museum site. 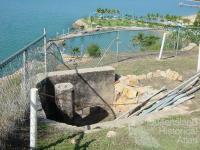 Fort Kissing Point was located overlooking Cleveland Bay in Townsville with two guns on wooden platforms. The Forts ceased operations in 1945 and later became part of the North Queensland Military Museum. The Green Hill Fort on Thursday Island was built between 1891-93 on a grassy hill overlooking the western end of Thursday Island. It was decommissioned in 1927 and is now a tourist site and museum.